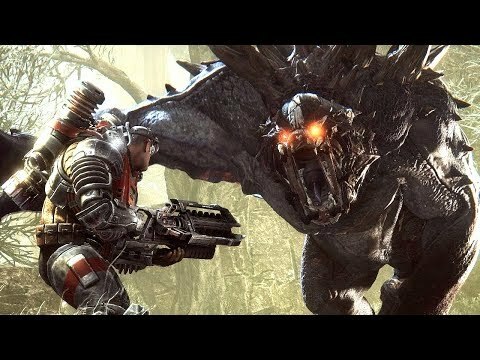 Evolve is an asymmetrical, cooperative/competitive first-person shooter video game, developed by Turtle Rock Studios and published by 2K Games. It pits four player-controlled Hunters against a ‘Monster’ controlled by a fifth player. Both Hunters and Monsters can use unique abilities during the game, and the Monster player can kill other smaller creatures to evolve and become stronger by entering a cocoon stage. The game will feature a variety of maps, one of which being a large jungle, with some industrial elements where players can take shelter. There are various power-ups that both Hunters and Monsters can obtain by killing the local wildlife. The Hunters are tasked with killing the Monster; while the Monster must either kill all four Hunters, or complete a secondary objective such as destroying a human base or power plant. The main focus of Evolve is the Multiplayer, however there is also a single-player campaign. Evolve was released on 1529d ago in the UK and the US.